Oh my! Check out this awesome 3 for 2 on all Lottie Dolls offer!!!! HomeOh my! 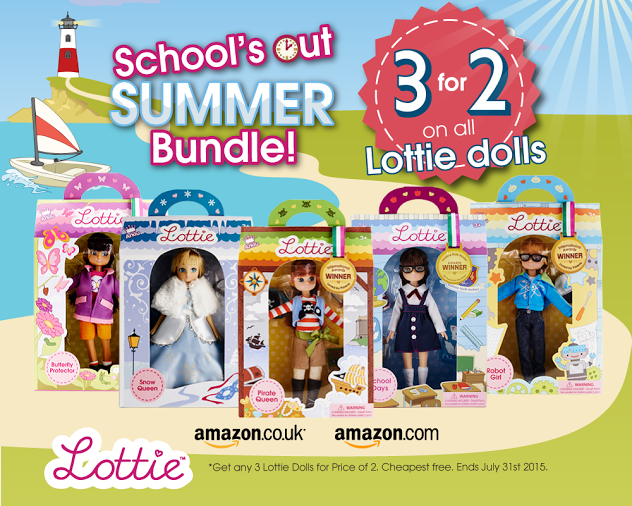 Check out this awesome 3 for 2 on all Lottie Dolls offer!!!! We just LOVE Lottie Dolls! Check out our last post to see our last review HERE. Lottie Schools Out limited offer; so, this means 3 Lottie Dolls for the price of 2 (cheapest Lottie Doll or accessory free, that’s a total of 33% off the entire purchase!) perfect for parents/guardians/gift buyers who have Summer birthday parties coming up, or want to stock up some Lottie’s in advance of Christmas or Back to School! Visit the Lottie Dolls/ Amazon page and when you check out, use one of these codes! The US Arklu US Store page HERE and Arklu UK & EU page is HERE. Cheapest Lottie Doll or accessory is free item, dolls and accessories cannot be combined for the offer. Offer applicable to be used across entire Lottie Doll and accessory collection, every product is included in this short-term exclusive offer. Email info@arklu.com if you have any issues! Visit the Lottie website to stay up to date with the latest!